The paper describes a laboratory course for undergraduate students of phonetics developed and used at the Department of Phonetics at Umeå university. The course consists of exercises designed to acquaint the students with basic acoustic analysis tools and methods used in speech research and experimental methods used in the study of speech perception. All instructions were in the form of web pages. Questionnaires, assignments and student tracking were administered using Internet-based tools. 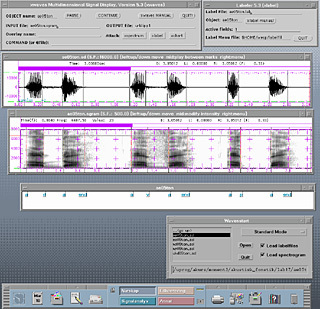 Acoustic analyses were made using the ESPS/Waves+ä analysis package; the perception experiments were run either entirely within a web browser or called from a web page but run in separate X-windows. Data collection and analyses were made in the UNIX environment and the results sent back to the students in the form of Java applets readable in web browsers. Laboratory work in phonetics and speech science is particularly well suited for telematic teaching. Students often work alone or in small groups, analysing their own voices or stored data, using computer-based analysis tools. Traditionally taught laboratory courses could be quite easily transformed into telematic courses as far as content and methods are concerned. There are several advantages to be gained by doing so. For example, the amount of time students need to spend on a given task may vary greatly. The telematic approach introduces a greater degree of flexibility allowing students to work at their own pace, until they master a particular task or have solved a given problem. Furthermore, the telematic approach opens the door to distance education, which plays an important role at Umeå University where this course was developed. In the context of distance education, however, there are at present several practical problems that need to be solved. Limitations in bandwidth make the transfer of speech data in real time too slow to be practical for most potential users, and today there are no analysis tools available that may be run over the Internet or semi-locally as Java applications in a web browser. Recognising the present technological limitations, a laboratory course for undergraduate students of phonetics has been developed at the Department of Phonetics at Umeå University. The course combines Internet based components with those that run outside the Internet environment. Instructions, examples and demonstrations, course administration, and student tracking all run in an Internet environment, while audio files, acoustic analyses and most of the perception experiments are handled in a UNIX environment. The laboratory course is scheduled towards the end of the first semester of a full-time course on phonetics. The course is taught in the student computer lab of the Department of Phonetics at Umeå University. The lab is equipped with nine Sun Ultra 1 workstations, which run under UNIX. The computers are networked and students have access to a wide variety of programs and analysis tools. Most of the acoustical analyses are made using the ESPS/Waves+ä signal analysis package developed by Entropic. This is a powerful set of tools enabling the students to make spectrograms, spectral analyses (LPC, FFT etc), pitch and format tracking and much more. The program package, taken out of the box, is not particularly user-friendly, but it allows great flexibility in customization. Our department developed an interface for selecting different custom made analysis environments, which allows students easy access to a wide variety of analysis tools from ready-made menus (Figure 1). Figure 1. A screen-shot of the interface. Each computer in our lab is equipped with three headphones so that students can listen to the sound files they are working with without disturbing other students or groups. The number of students taking the course has ranged from 15 to 20. During contact hours students work in groups of two or three. Although students work in groups, all assignments have to be handed in (i.e. submitted over the net) individually. Outside of contact hours, they often work alone. Figure 2. Students working in the lab. The course consists of 17 laboratory exercises, each centred on a given topic; suggested background readings as well as demonstrations and experiments are included. The total number of contact hours is 30, but students have access to the laboratory outside these hours and are free to work through the course at their own pace, within given deadlines. All instructions for the laboratory exercises are in the form of Web pages, but the course recommended textbook is used for the background readings. Questionnaires, assignments and student tracking are administered using Internet-based tools. This part of the course has been developed with the help of the WebCT [URL1] course development tool. Web pages: 2 examples of lab exercises (Lab 2 & 17). All acoustic analyses are made outside the Internet environment, using the ESPS/Waves+ä analysis package. Since the instructions for the exercises are made with a particular analysis package and computer environment in mind, accompanying illustrations are tailored to corresponded to what the students encounter on their screens as they perform the experiments. Experiments and measurements are performed on pre-recorded material accessible as digitized sound files. Although the equipment allows on-line recording, we have not used this option because of poor sound quality. The sound files contain simple and complex non-speech signals as well as recorded speech illustrating various linguistic phenomena such as VOT, vowel quantity, and fundamental frequency contours. The non-speech signals are used to familiarize the students with analysis techniques and units used in describing acoustic properties like decibel and Hertz. In the speech files students measure selected acoustic parameters and are asked to reflect upon their significance for speech production and perception. The perception experiments are accessed from a Web page. All programs are written in Java and could run as Java applications inside the browser, but because of poor sound quality only one of the experiments was delivered this way. The rest run in windows outside the browser and use audio tools from the UNIX environment. Data collection and analyses are also run in a UNIX environment. The results are sent back to the students in the form of Java applets readable in their Web browsers. The student's own result is presented, in the form of a diagram, immediately upon the completion of the experiment. In a full-scale scientific experiment, a large number of stimuli must be used to obtain reliable results. Such an experiment is therefore often quite time consuming. The idea behind using the experiments in the context of the course described here was, however, not to obtain highly reliable scientific results, but to acquaint the students with the procedures and techniques used to obtain such results and to give them a feeling of what it is like to be part of such an experiment and their own reactions to it. It is possible though, even given these limitations, to obtain results, which fairly reliably mimic the results of full-scale experiments by pooling the results of a group of subjects. After completing a given experiment and having viewed the result, students have the option of adding their own results to a pool of results submitted by other students by pressing a button marked 'Send in', and view the pooled results by pressing a button marked 'Group result'. The diagram showing the group results may be updated at any time to include the most recent results. The perception tests were chosen to illustrate some basic properties of the auditory system such as temporal integration and the threshold of hearing. In addition a re-creation of a classical test on Categorical Perception is included. Web page: An introduction to the perception experiments and links to the author's web site (in Swedist). The course has been given twice to first-semester phonetics students and also once to a group of speech therapy students. Most students had little or no experience with computers. This caused some initial problems, but this disadvantage was outweighed by the students' feeling that the exposure to computers and the Internet was useful to them in other contexts. Comparing the students' results on theoretical parts of their written tests and assignments, we found that they performed on par with students in previous years when the course was taught in the form of lectures supplemented by a few laboratory exercises. Their command of analysis procedures was, however, markedly better, as was their understanding of these procedures and the relevance of acoustic analysis in the study of speech. Their understanding of experimental techniques and results in the field of speech perception was also improved. The immediate feedback of the results of their own perception tests and the possibility to view the accumulated results as more subjects complete the task gave them deeper insights both into experimental techniques and the particular aspects (i.e. Voice Onset Time, vowel quality vs. formant frequencies, threshold of hearing) illustrated by a given set of exercises.